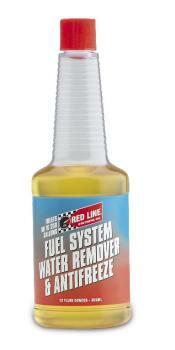 Red Line Water Remover & Antifreeze is designed to actually remove water from a diesel or gasoline fuel system. It also works to significantly reduce the freezing point of water in the fuel system. Disperses equal amounts of water in fuel and reduces the freeze point of an equal amount of water to 0ºF. Treats 250 gallons and can be used in gasoline or diesel fuel. Also provides excellent fuel lubrication in diesel and gasoline engines.